An armed park ranger accompanies our fellow hikers along the trail to Mt. Meru. As we set off along the trail, we made sure to walk closely behind the ranger who was carrying a loaded rifle. We kept our eyes and ears alert for any signs of animal activity in the lush forest lining our route. While there was a slim possibility of running into a wild animal, in all likelihood, the more probable danger was that we might get distracted by a flock of silvery-cheeked hornbills flying overhead and fail to side-step the huge piles of fresh buffalo dung scattered along the trail. Although we had been in Tanzania for less than 24 hours, it didn’t take long for us to realize that we weren’t in Kansas anymore. Matt and I had signed on for a four-day hike of Mt. Meru, primarily as a training hike for our impending ascent of Kilimanjaro, but we were quickly discovering that Meru deserves to be a destination in its own right. For starters, Mt. Meru lies within Arusha National Park. In addition to its beautiful scenery, the park is home to a wide variety of flora and fauna that can be appreciated right from the trail. Day One started at 1500 meters at Momella Gate where a small army of guides, porters and cooks assembled to accompany us and the ten additional international hikers setting out that day. After “weigh in,” a tedious process that involved each porter weighing his load and getting approval from the park staff, we met Joseph, the park ranger assigned to our group. Finally, we all set off, making our way “pole pole” (slowly, slowly) up the 900 meters to our first night’s accommodation at the Miriakamba Huts. A mere ten minutes down the trail, we found ourselves gazing at a large herd of buffalo giving us the stink eye, and we were instantly grateful for Joseph’s protection. 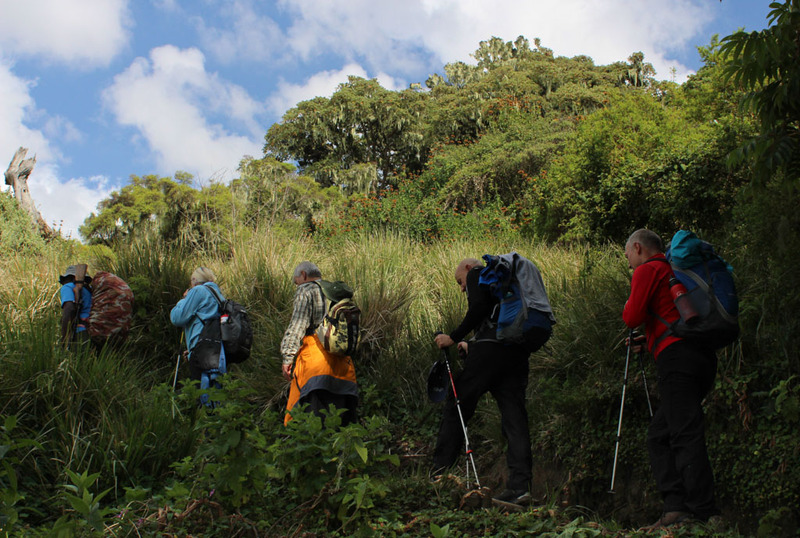 The Meru hike is also a good challenge, and many people claim that it is actually more difficult than the more popular and longer Kilimanjaro trek. Each day entails a significant gain of altitude, and reaching Meru’s 4566 meter summit is far more technical than its higher neighbor, although we were blissfully unaware of that when we set out on that first morning. At the time, we were just happy to be hitting the trail and eager to see if our training in the pancake-flat environs of Chicago would pay off and make our next twelve days of trekking a bit easier. Along the way, dapper-looking black and white colobus monkeys monitored our slow progress from their lofty perches in the thick canopy above, and we caught glimpses of brightly-colored birds flitting through the trees. We marveled at the lushness of the forest and enjoyed a pitstop beside a strangler fig that had grown so large that a road had been cut through its base large enough for the occasional safari vehicles that shared our route that day. We had been expecting to camp, so our accommodation in the hikers’ huts seemed luxurious by comparison. Each small room contained two sets of bunk beds with thick mattresses and pillows provided. We were assigned a room to ourselves where we could spread out our gear and air out the day’s hiking clothes. Dinner was served in a separate dining hut, and the Masai tablecloths, choice of hot beverages and table service from our waiter made the whole experience seem quite civilized and cushy. We enjoyed freshly-popped popcorn as a snack with our tea, followed by a delicious dinner of homemade soup, potatoes and vegetable stew which warmed our chilled bodies while also filling our empty stomachs. When we awoke the next morning, a thick layer of clouds had settled onto the mountain, and the visibility was no more than a few feet as we set off for the Saddle Hut. Gaining another 1000 meters across the day, the trail on Day Two was an endless set of steps and switchbacks, but the scenery was so beautiful it was easy to take your mind off the physical aspect of the journey. The thick fog made the forest seem particularly verdant and ethereal, and we tried our best to capture the scene with our cameras before the rising sun burned off the morning mist. As we gained elevation, the trees slowly gave way to bushes and flowering plants, and the number of bird species we encountered seemed to multiply. Before long, we reached an ecozone known as heather moorland, and the strange formation of the trees growing prolifically in the area made us feel like we were hiking through an enchanted broccoli forest. 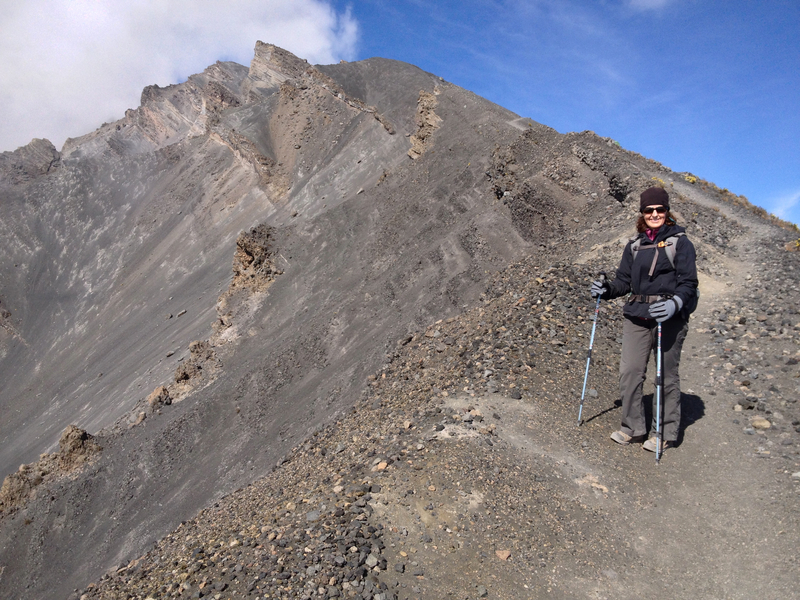 At 3500 meters, Saddle Hut is the base camp for summitting Meru. We arrived there in time for a late lunch and then took a short rest before setting off on an acclimatizing hike to Little Meru, the smaller version of the mountain’s namesake. Our guide Rashid managed to time this perfectly for a stunning sunset view of Kilimanjaro. We sized up Meru’s formidable neighbor and tried to convince ourselves that hiking it couldn’t be too much harder than getting to the point where we currently stood. As beautiful as the scenery was, we couldn’t enjoy it for long. After a few photos, Rashid told us it was time to head back down to the hut for a hearty dinner and an early bedtime. We were awakened at midnight for our summit attempt. We piled on layers of clothing over our long underwear, and, after drinking a quick cup of tea to warm up and eating a few biscuits, we donned our headlamps and headed out into the night. Even though the darkness and cold were new elements to contend with, the first hour’s hike up to Rhino Point (3800 meters) was no more strenuous than our two previous days of hiking. Rashid kept us at a slow and steady pace, and we dutifully followed him in the dark, learning the Swahili words for stars, moon and night along the way. Beyond Rhino Point, the trail became much more technical, and our first test came when we had to skirt a rocky outcrop on the backside of the peak. With only the light of our headlamps to see, we clung to the side of the mountain for dear life—nothing but a dark abyss appeared below, and it seemed like any slip would surely result in a certain and painful death—the kind you see in movies when the evil villain finally gets what’s coming to him and plunges into the darkness. While this stretch of the hike lasted for only about twenty minutes or so, it seemed like it would never end. Along the way, Matt noticed eye hooks drilled into the rocks that were meant to hold ropes to help hikers safely traverse the cliff. Of course, those ropes were missing, and Matt hoped their absence would slip my attention. He wisely kept this information to himself knowing it would not ease my trepidation. On the other side, we found ourselves on a volcanic rim where we enjoyed the sure footing of the volcanic sand that we found there. We crossed another narrow rock escarpment before continuing further along the rim. By this time, it was just a few hours before dawn, and the coldest part of the night was upon us. The wind picked up, and the cold became increasingly unbearable. We stopped briefly to put on our rain jackets and rain pants for a wind break and began to worry that we had not packed enough layers to deal with the elements we were facing. Matt forgot to tuck the hose to his Camelback back inside his pack and discovered that it had frozen solid! The last phase of the hike was the toughest. The sandy path gave way to a series of rocky peaks, and we had to pick our way over jagged rocks and boulders for more than an hour to reach the summit. A thick cloud enveloped us, and the higher we went, the more the temperature dropped. We could actually see ice forming on the rocks as the freezing water vapor of the cloud settled over the mountain. Finally, Rashid pointed out the flag at the summit that marked our end destination. Looking up at the steep vertical ascent, we had to fight the strong urge to say, “Right here is good enough. Don’t you think?” Pressing on, we huffed and puffed as we made the final push to the top. We were greeted with hugs and high fives by the other hikers who also had summited that morning. In all, we were a mere twelve people in total—8 hikers and 4 guides—and it was a good thing, too, because Meru’s actual summit is quite small. We all huddled together for warmth and jockeyed for the chance to take pictures under the Tanzanian flag. From the top, we enjoyed the sunrise over Kilimanjaro and marveled at the strange, rocky formations peeking out of the clouds below us. It was incredible to experience such a magnificent scene with so few other people. At 4566 meters or just under 15,000 feet, Meru is the highest mountain that we had ever summited, but the freezing temperatures and biting wind didn’t allow us to enjoy our accomplishment for long. We snapped photos for as long as we could stand to have our gloves off and then started the long descent back to the Saddle Hut. The way down was only slightly easier than the ascent, but we were grateful to discover that much of the perceived danger we had experienced on the way up had vanished with the daylight. 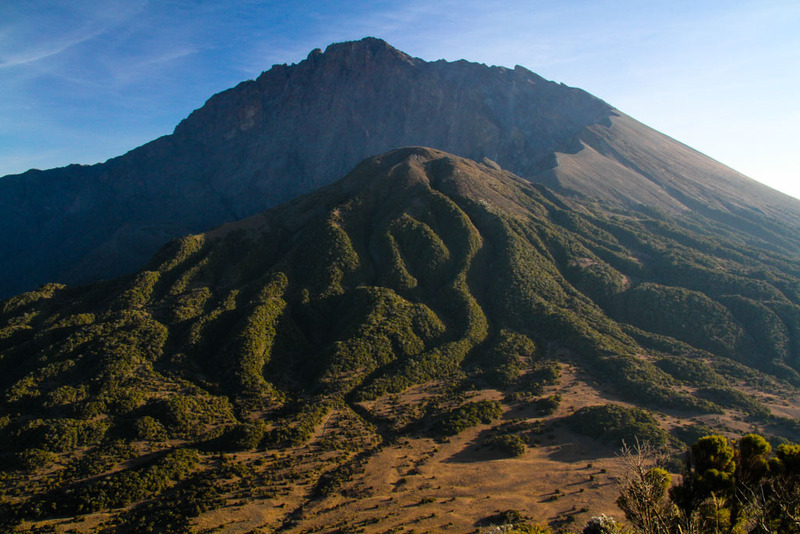 Now that we could see our surroundings, it seemed like a brand new hike, and we enjoyed the views of Meru’s ash cone that had eluded us in the dark of the night. Back in the safety and comfort of the Saddle Hut, we agreed that the early departure, the high altitude, the freezing temperatures and the technical aspects of the trail all combined to make Meru’s summit hike the most challenging day hike we had ever done. And it wasn’t finished yet! After a quick rest and a hearty meal, we packed up again to retrace our steps back down to the Miriakamba Hut, making for one very long day of hiking. Exhausted, we climbed into our sleeping bags and enjoyed a well-deserved night of sleep. We rose early the next morning for our final descent back to the Momella Gate, bidding farewell to our Tanzanian support team and our new hiking buddies. While our primary goal for hiking Meru had been to acclimatize for the even higher altitudes of Kilimanjaro, we also hoped that we had found our “mountain legs” and that this new level of fitness and confidence would aid in tackling this next big challenge. No matter the ultimate outcome of that, we were happy to have had this amazing experience. Check out the video below to see more of our time on magnificent Mt. Meru. Practical Information: We booked our Meru hike with the US-based tour company Adventures Within Reach (AWR). We knew that booking with a local operator would be cheaper, but we did not know anyone who had done this hike and could give us a recommendation for a reputable company. We also toyed with the idea of booking a tour once we had arrived in Arusha, but we were wary of wasting a lot of time on the ground shopping around when we would much rather be out hiking or on safari. In the end, we booked our entire trip with Adventures Within Reach, opting for the ease of using one company to create a seamless itinerary for our month in Tanzania. It was more expensive than stitching together a hodgepodge of local outfitters, but this allowed us to enjoy every second of our trip without wasting any of our precious time in Africa. Lonely Planet suggests that it is possible to arrange the Meru hike on your own, but the complications of organizing transport to the park (public transportation proves difficult), hiring porters and walking with an armed guard made the ease of using an outfitter a better option for us. Going with an experienced guide has its benefits as well. In retrospect, we could not imagine finding our way in the dark past Rhino Point on summit day! Upon arrival in Tanzania, AWR’s local partner, Tanzanian Journeys, handled every aspect of our trip. We were very happy with them and highly recommend their services. Our guide was very professional, the food was healthy and delicious, and our safety was always their top concern. The night before our departure, we stayed very close to the Arusha National Park entrance at the very pleasant Meru View Lodge. They stored our extra bags for us free of charge while we were on the hike. This seems to be the norm in Tanzania—a welcome service on an extended trip like ours. Tanzanian Journeys also arranged a safari truck to meet us at Momella Gate right after finishing our trek to take us on a game drive to the other areas of the park. While we enjoyed the experience and it would be hard for us to pass on any opportunity to go on a safari, Arusha does not have the diversity or numbers of animals (no big cats, for example) that are found in Tanzania’s more popular parks. If you are headed to any of the other parks in northern Tanzania, you can probably save yourself the time and money and skip this one. WOW! What an incredible adventure. Thanks for sharing your pictures and words. I’m grateful to be experiencing your trip secondhand. Thanks for your support, Rachael. We really appreciate you taking the time to read and comment. THANKS! SO WONDERFUL GUYS! I LIKE IT! Thank you, Hassan! We’re so honored that you read our blog when you aren’t out on the trail being a porter–what a hard job that is! Please send our best to our Kili team. We miss you all! That was quite a 4 days. No wonder Telluride was so easy for you. And the pictures are great. How did you get such good close-ups of birds? Telluride was a good 5000 feet lower than Meru, so it did seem a lot easier by comparison. We saw lots of beautiful birds on the trail, but we never seemed to have the camera or the right lens out at the right time. Unfortunately, we missed a lot of great shots. It’s a lot easier to get good photos when you are on safari when spotting and photographing animals is the primary goal. Thank you. The Meru trek was really gorgeous. We wish we could do it all over again! I’m impressed by the awesome hiking you two do. I can’t imagine getting up at one in the morning to go trekking! Congratulations! We were pretty nervous about getting up so early and hiking in the dark, but it turned out that was the easy part-we should have been more worried about the freezing temperatures and the challenging terrain! That bit on having to cling to a cliff–in the dark!–sounds terrifying. I would have been shaking the whole time. Just now catching up on your trip to Africa. Sounds amazing so far–and like things greatly improved after your rocky adventure getting there! I (Alison) was definitely out of my comfort zone. I kept huffing and puffing, and, though I could easily have blamed it on the altitude, I knew it was really from fear! I am sure our guide Rashid was pretty nervous about how I would manage on Kili, but things were a lot better once the sun came up. Thank goodness!